My mother made the most amazing apple pies. The filling was a perfect blend of sweet-tart fruit and the pastry was buttery and flaky. Her bread was perfection--a tender white loaf enrobed with golden brown crust. Her fried chicken was crisp and crunchy and the potato salad from her kitchen was tangy with dill pickles, eggy, creamy--worthy of awards. But then, there were the pork chops. Mom's pork chops were a completely different story. It is apparent that my mother believed any hooved animal must be sacrificed--in other words, cooked to near cremation. The only beef I remember was hamburger simmered for HOURS in canned tomato sauce and served over spaghetti; this was somewhat palatable. However, pork chops were not accorded the same funereal preparation. 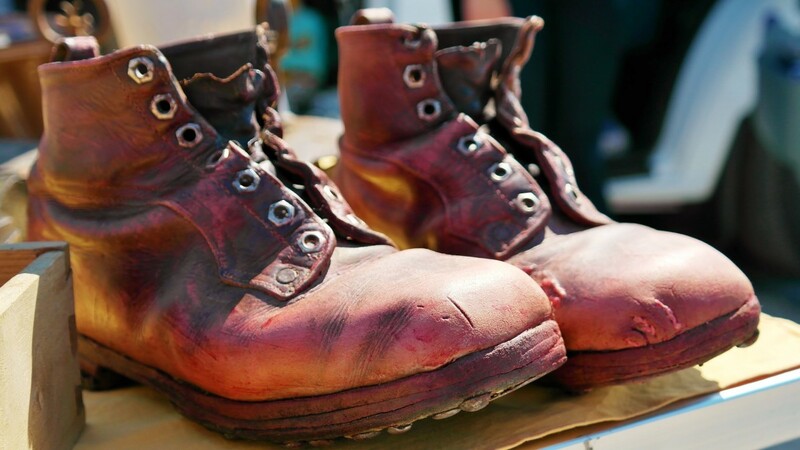 Mom's chops were fried, and fried, and fried some more until they were grey, lifeless and as tough as the soles of my hiking boots. I HATED pork chops...until I ate them at a friend's house. I couldn't believe that what I was tasting was an actual honest-to-goodness pork chop. I didn't need a sharp steak knife, sturdy fork, and lots of sawing back and forth. This meat was fork-tender, moist, and full of flavor. Absolutely Heavenly! Sad to say I never learned the secret of my friend's perfect pork chops, but with many years of trial and error (and with GREAT emphasis on the error part), I have found, at last, the Holy Grail. 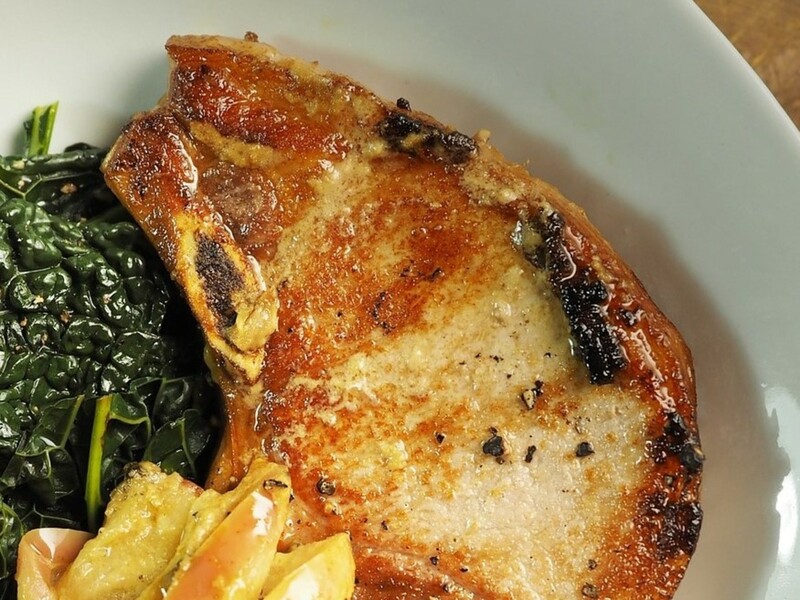 There is a way to cook pork chops so that they are moist, flavorful, fork-tender, and totally melt-in-the-mouth. What Part of the Pig is a Pork Chop? 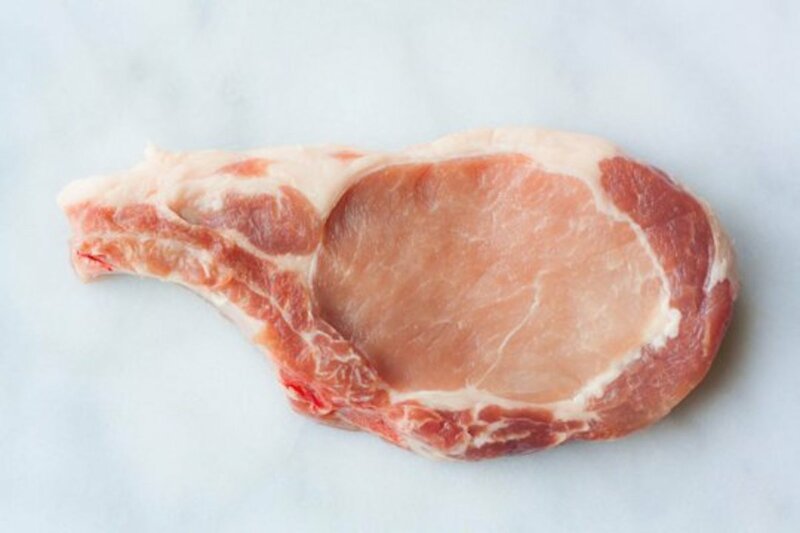 Pork chops come from the upper portion of the pig (along the backbone) from the shoulder to the hip. This is the area that includes the tenderloin--an expensive cut of meat that, I think, is not worth the high cost. Yes, it is easy to prepare and is tender and moist (when handled properly), but is seriously lacking in flavor. If I have the choice of a slice of pork tenderloin, or a perfectly cooked pork chop, I will opt for the chop every time. 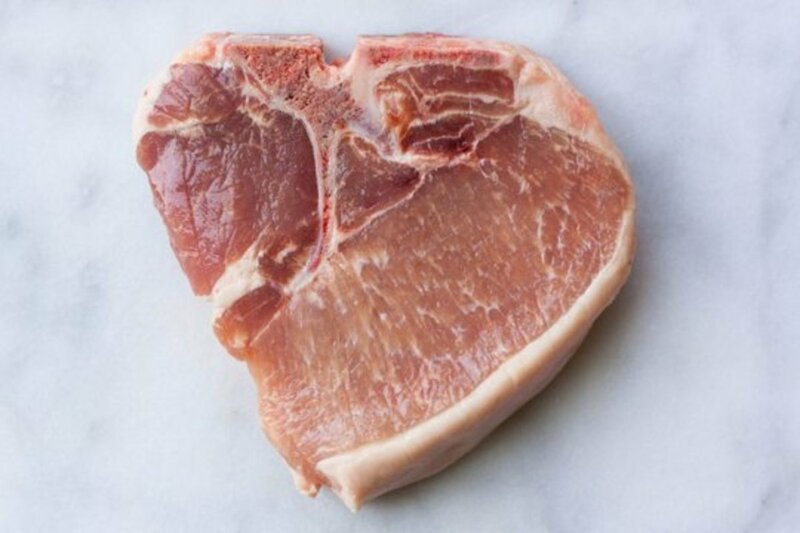 To cook a truly wonderful pork chop, you must first start with the correct cut of meat. Also known as blade chop, blade steak, pork loin blade chop, pork shoulder steak, pork shoulder blade steak, or pork steak. The meat is dark-colored, has quite a bit of fat, some gristle and bone but is hugely flavorful. Shoulder chops need a slow braise (moist heat) to cook properly. 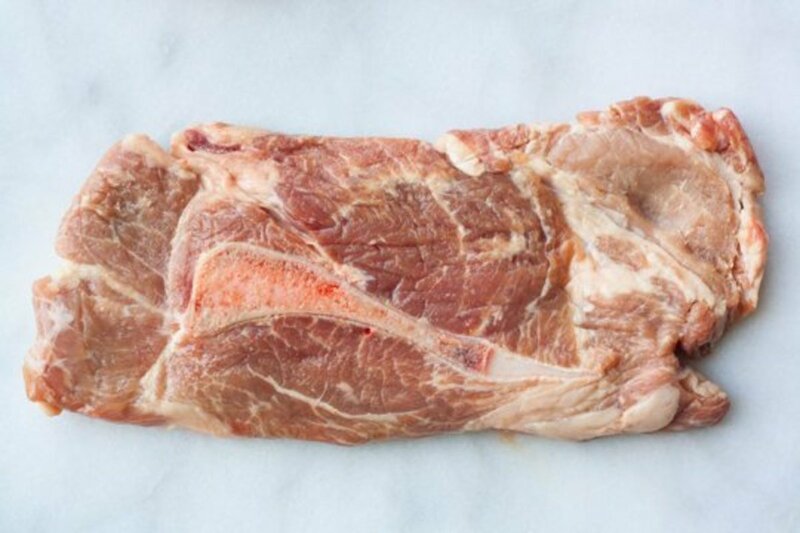 May also be named center-cut rib chop, pork chop end cut, pork rib cut chop, rib end cut, rib pork chop. Obviously, these come from the rib section (the rib bones are baby back ribs). There is no tenderloin meat in this cut. 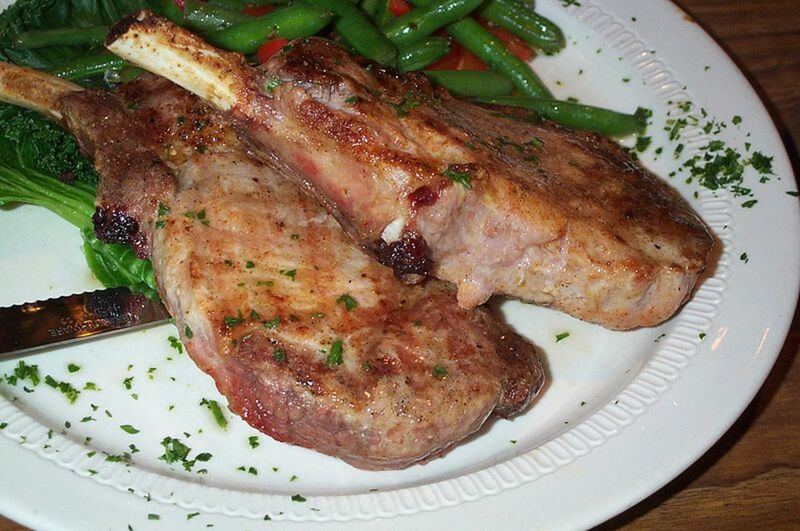 These chops have more fat than loin chops and are very tender and have a mild flavor. They are lean. Other names might be center loin chop, center-cut loin chop, loin pork chop, pork loin end chop, porterhouse, top-loin chop. This cut comes from the hip, toward the back of the pig. They are very lean, with a mild flavor. 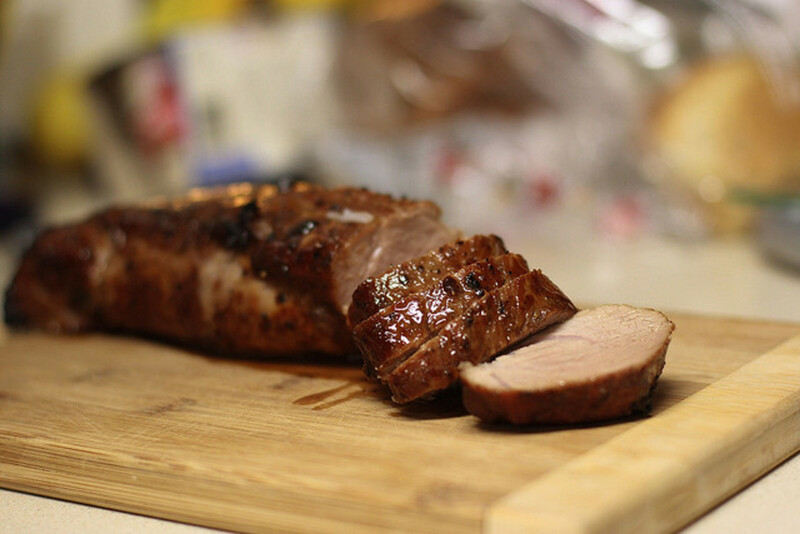 Because this cut contains both tenderloin and loin, they can be difficult to cook. This might also appear in the butcher shop as a sirloin steak. This is a lower-cost cut, from the hip area. There is a higher percentage of bone than in other cuts. 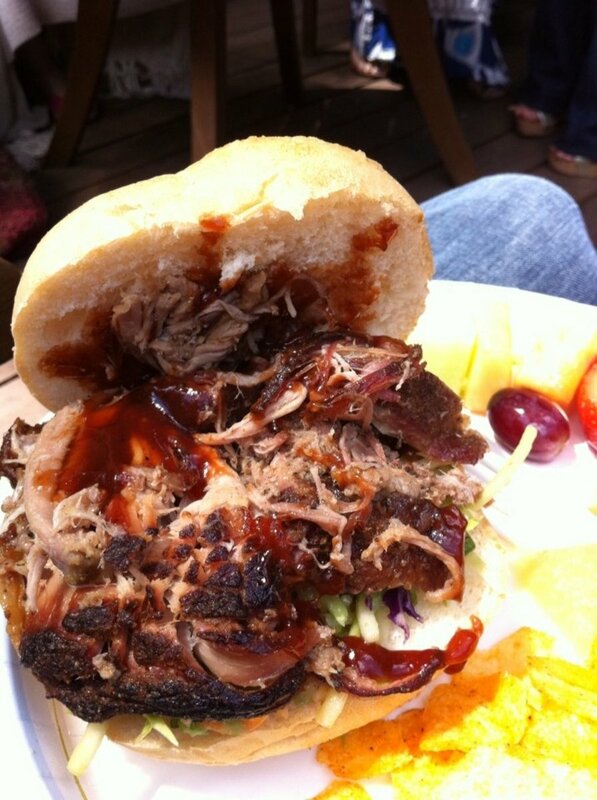 However, this particular chop is high in pork flavor, but can be really tough. These should be cooked slowly, in a moist-heat braise or stew. So which chop is the winner when selecting the perfect cut for an extremely moist, tender pork chop? Hands down, it is the rib chop. Once upon a time brining was for pickles. But about a decade ago people started to brine their Thanksgiving turkeys. And guess what? It was no longer a given than turkey would be dry, stringy, and tasteless. When brined, that turkey became as plump as Great Aunt Matilda. Now, I will admit that I have never brined a turkey--the Carb Diva family typically cooks a 25 pound monster, and finding a vessel large enough to brine that behemoth is not an easy task. But brining a couple of pork chops? I can do that. And The Science of Brining (below) explains why you should too. Brine is a salt dissolved in water. Two simple ingredients that can make a world of difference in your cooking. The salt in brine not only seasons the meat, but it also promotes a change in the meat protein structure, reducing overall toughness and creating gaps that fill up with water and keep the meat juicy and flavorful. Low roasting is cooking at a low temperature--on my ovens the lowest possible setting is 175 degrees F. and that is the temperature that we will be using for our chops. Why is low-roasting preferable to the standard method of roasting at 350 degrees (or more)? Let's think for a moment about what happens when a roast is prepared in the oven. Let's say that we want to prepare a prime rib, and we want it to be medium rare. The correct internal temperature to achieve medium-rareness is 130 degrees F. If roasted in that 350 degree oven, it is obvious that by the time the interior reaches 130 degrees, the exterior will be much hotter--probably closer to the 350 degrees of the oven. The exterior will be brown, it will be dried out, and it will be closer to well done than medium rare. Now, of course a roast or a rib pork chop cooked at a low temperature will be moist and tender, but it will also have a very bland, pale color. 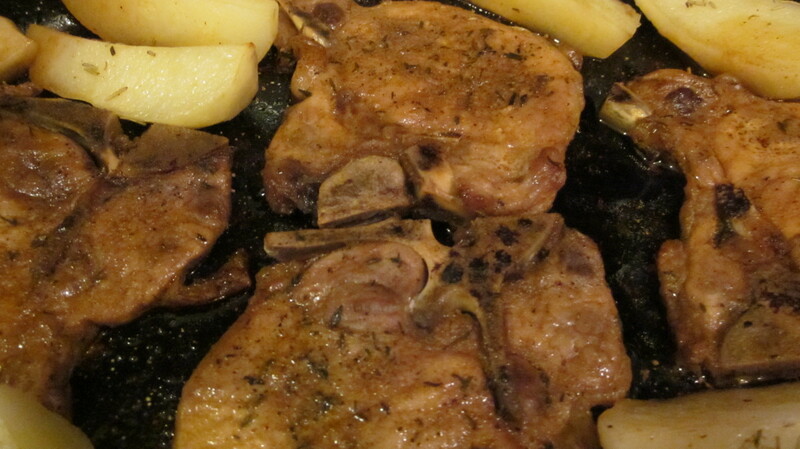 That is why we quickly sear the chops on the stovetop before putting them in the low oven. Combine salt, sugar, and 1 cup of the water in a medium saucepan. Bring to a boil over medium heat; reduce heat and simmer, stirring constantly, until salt and sugar and dissolved. Remove from heat. Add remaining 2 cups of water to the salt/sugar solution. Stir to combine and reduce heat. Submerge the pork chops in the salt solution. They should be totally covered by the brine. Cover and refrigerate at least 30 minutes and up to 4 hours. Place olive oil in oven-safe sauté pan and heat over medium-high heat until oil is shimmering. 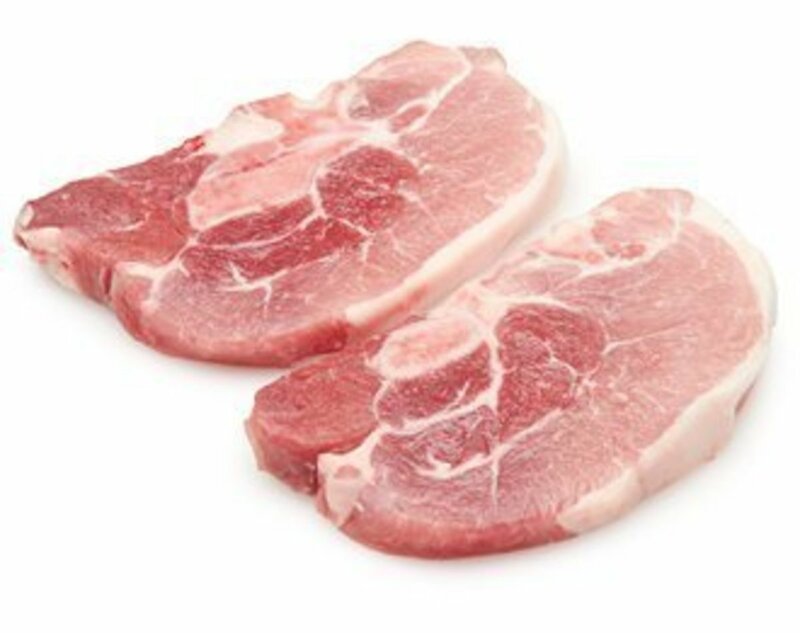 Remove pork chops from brine. Pat dry with paper towels. Carefully place in sauté pan and sear for about 2 minutes; flip and sear another 2 minutes. Remove from heat. Cover and place in preheated oven. Roast until internal temperature reaches 145 degrees F.—about 2 hours. Meat will still be slightly pink inside. If you have an old meat thermometer you are probably thinking that I have either made a horrible mistake or I am insane and not to be listened to. 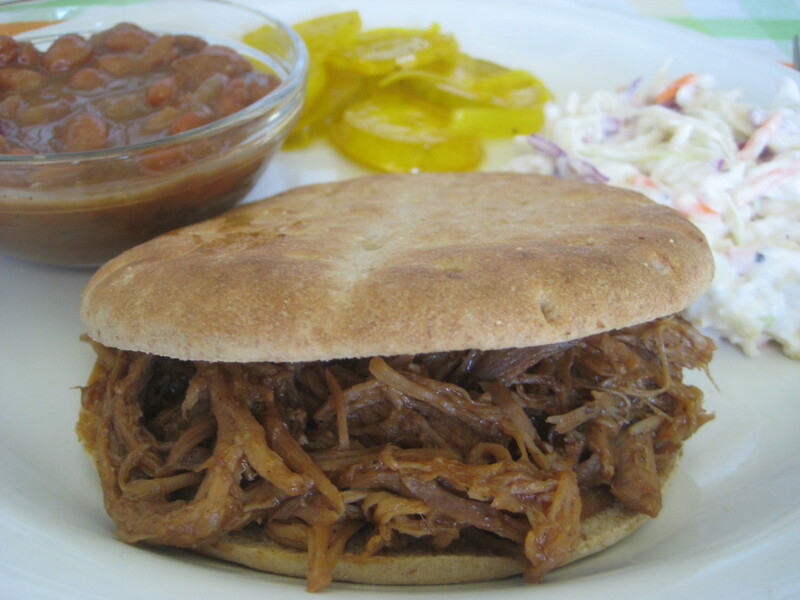 The U.S. Department of Agriculture (USDA) ,has changed their recommendation for the safe cooking of pork. Years ago, we were told that pork must be cooked to an internal temperature of 180 degrees F. That is no longer the case. So, our pork is less likely to turn into shoe leather. Another consideration is that pork today is not the pork that our parents or grandparents ate. It is bred to be much leaner, so those old school high temperatures would certainly render it dry, tasteless, and unpalatable. Some combinations are just magical, aren't they? Hot dogs and mustard, pancakes and syrup, spaghetti and meatballs, and the list goes on. But there is one combination that you don't want to come from your kitchen--food and bacteria. Now keep in mind that not all bacteria are bad. If not for bacteria we would not have yogurt, pickles, or soy sauce. Those foods are made with the help of healthful bacteria. But many other strains of bacteria are dangerous and can even be deadly. No doubt you have heard of outbreaks of salmonella from improperly handled fast food or e coli from contaminated salad greens. You can avoid this problem and keep yourself and your family safe if you understand how bacteria grow and what you can do to prevent that growth from happening. Once the danger of preexisting bacteria has been removed, slow roasting can proceed without worry. Hi Amy - I'm sorry your chops didn't turn out as you had hoped. It sounds like you're getting really close though. With an oven temp greater than 175 it's hard for me to guess what your next step should be. As you know, an internal temp of 150 is greater than you want for the perfect pork chop. Your oven temp was 15 percent higher, so one could assume that your meat would be done 15 percent sooner -- or 20 minutes, which is what you did. But it was still overdone. Do you have an instant read thermometer? If you can pull them out when they are 140 they will continue to rise in temp after you pull them out of the oven. In those last few minutes the temp soars rather quickly. I would suggest checking on them at 1.5 hours (rather than 1 hr 40 minutes) and see where they are. Please let me know how that works for you. Again, I am sorry that you experienced some difficulties with this recipe. I get boneless top loin chops from Costco. They are about 1 and 1/4 inch thick. My stove's lowest setting is 200. I followed the recipe cut about 20 minutes off the chops turned out much better than ever however still a little dry. When I pulled them out of the oven the internal temperature was about 150. Any adjustments suggested? Bravewarrior - I have a HUGE rosemary bush--actually it's about the size of me (I'll let you draw your own conclusions on what that actually means). Guess what I'll be doing with my next batch of pork chops. Yours sound wonderful. Thanks for the inspiration. I love your explanation of brining. Now it makes more sense to me why so many chefs these days prefer to brine all kinds of meat. 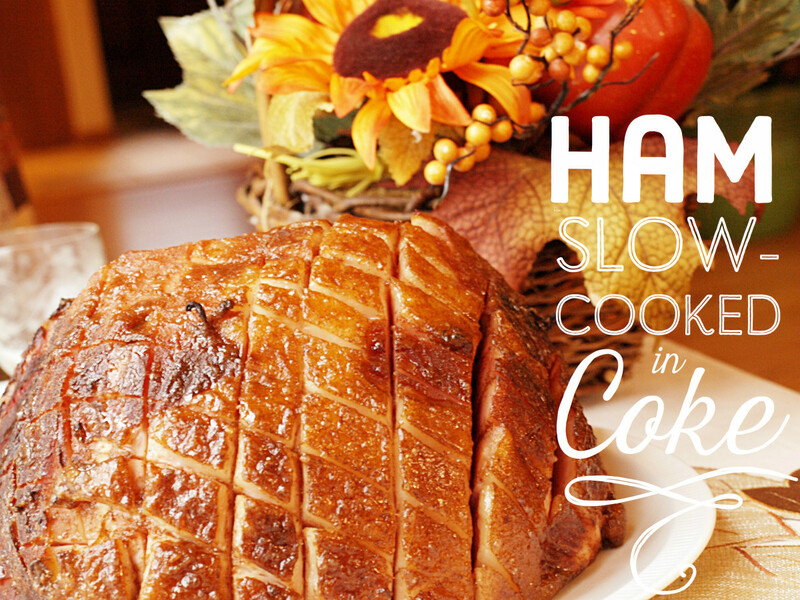 I don't know if I'd have the patience to slow cook pork chops. If I buy the bone-in rib cut I usually fry them in grape seed oil. But my favorite way to cook chops is to use boneless center cut chops and marinate them in a small amount of olive oil with sea salt, white pepper and rosemary. Then I either cook them on the grill or pan sear them and put them in the oven for a few minutes. I love rosemary and pork together. Very yummy combination. Flourish - I'm glad I gave you a chuckle. Even my sister agreed about mom's cooking of meat. However, my mother in-law set the bar pretty high--it took me a long time to come even close. I loved your description of your mom's cooking. It made me laugh and reminded me of my mother-in-law, God rest her soul. Thanks to her, my husband thinks nearly everything I make is delicious. Kalli - Maybe it's a generational thing. Years ago we were taught that pork is full of nasty worms that had to be obliterated (what a delicious thought). 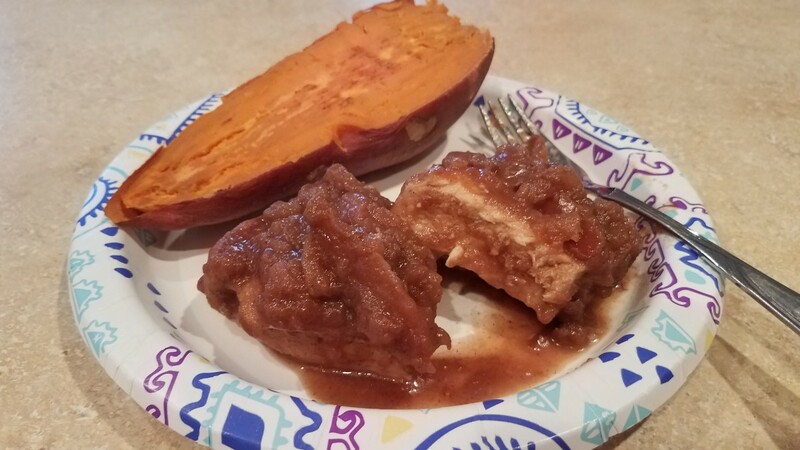 I will agree that gravy is never a bad thing, but tough is tough and like an over-ripe banana nothing will ever allow it to time travel back to when it was palatable. Thank you Rachel. I do hope that you like them. Be sure to get thick chops--mine were an inch thick. Hi Carb Diva, I love pork chops and so does my husband. So I was happy to see your hub title. I make pork chops different ways but this one sounds so delicious and juicy, it's the next way I'm going to make it. 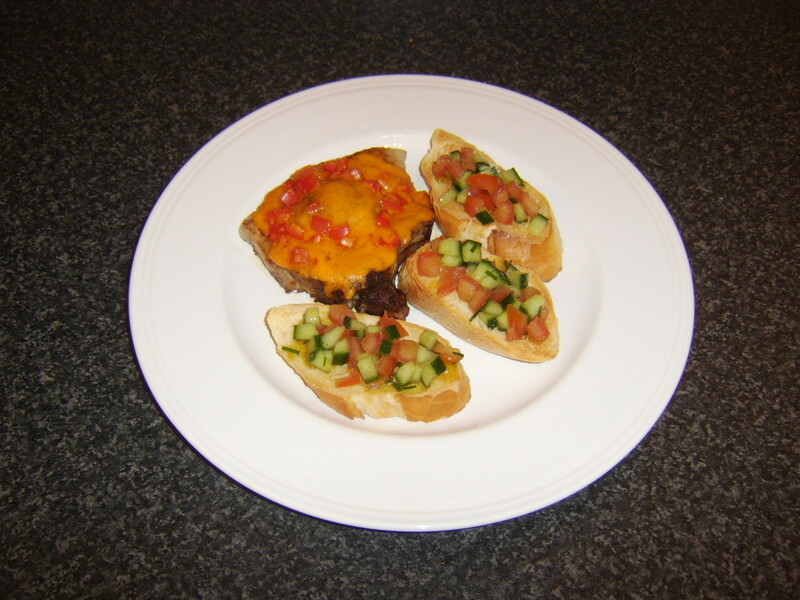 Thanks for sharing this recipe and the information. I'm pinning it. Vocalcoach - I don't think my mom ever heard of trichinosis--she just cooked every piece of red meat until there wasn't one drop of blood left in it. I appreciate that you took the time to read my hub and comment even though you are a vegetarian. My daughters are veg. also. Oh, how I loved my mothers pork chops growing up. Because she was leery about pork (worms) she cooked the way your mother did. But I loved super-well-done! I'm now a vegetarian - but I do miss those pork chops. Eric, I'm only the Carb Diva, I don't have superpowers so that I can teleport to your part of the world. Find out how she cooked those amazing pork chops. I'd love to know her secret (I will be the first to admit that there is more than one right way of doing something, even something like cooking pork chops). Thanks. Great stuff. I look forward to giving this a shot. I was not paying attention but my wife cooked some great pork chops the other night. I generally bake and then broil mine. Jackie - I can never have enough sisters! Wish you lived nearby. I know we'd have way too much fun. Thanks for your kind words and for stopping by. This sounds delicious and I like the rib chop best too and I do a quick grill on everything I bake (except whole birds of course) to add that yummy flavor. My mom and mom in law were both great cooks but they both rolled everything in flour and I was up in my 20's and was all out of flour before I realized what grilled taste like! Now I never use flour. I would just love to be your sister to come over for some of that great cooking! Bill, this recipe is so easy I'm sure even you could do it. Why not surprise Bev? I do feel just the tiniest bit guilty, but I think I'll survive. I haven't had a good pork chop in months...sigh! Tonight I'll be eating a fried baloney and cheese sandwich. I hope you're feeling guilty now. LOL Have a great weekend.